When James Ballantyne discovered the prehistoric adze in the sand of the Graham Brickyard (near Brantwood Park) in 1892 very little was known of the original inhabitants of the area. Recent archaeological work has identified a thriving aboriginal population that inhabited the area from about 8,500 years ago. Some of this evidence has recently (2004) been exhibited at the Canadian Museum of Civilization including the Ballantyne adze. As reproduced below (in part) with kind permission, the Museum's present website offers a sketch of the the original inhabitants of Ottawa East. Today, the Ottawa Valley is the home of a nation's capital and an active participant in the high-tech sector of the twenty-first century. In the nineteenth century, it was at the heart of the Canadian logging industry. 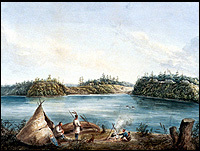 Before that, the Ottawa River was a major travel route for explorers and fur traders. However, prior to the arrival of Europeans, the region had witnessed thousands of years of Native history. Kichi Sibi, which means great river in the Algonquin language, provides an overview of the ancient history of the Ottawa Valley using artifacts found in the region. Picnickers, hikers, farmers and avocational archaeologists found these objects over the past 150 years and donated them to museums. Their generosity, hard work and interest in preserving the past have given us a greater awareness of the Valley's ancient history. The artifacts found throughout the Ottawa Valley allow archaeologists to piece together the region's ancient history. They tell us, for example, that Native peoples lived here for about 8,000 years before the arrival of Europeans. Fifteen thousand years ago, the continental glacier, which extended over all of eastern Canada, began to melt, leaving behind vast bodies of water. Some 12,000 to 13,000 years ago, the Ottawa Valley was covered by an inland sea called the Champlain Sea. It was about 150 metres higher than the current river levels in Ottawa-Hull. The regions environment was barren, cold and inhospitable. It is not known if people lived here at the time. The Champlain Sea, which covered the Ottawa Valley until about 10,000 years ago, supported a rich variety of marine life, including whales, seals and several species of saltwater fish. Small herds of caribou and other Arctic animals probably lived in the area around the sea, but no evidence has been found of a human presence in the region. 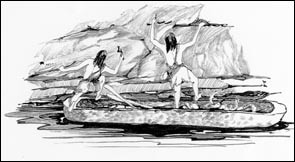 The earliest evidence of a human presence in the Ottawa Valley dates from approximately 8,500 years ago. Environmental conditions had improved considerably by that time, as the Champlain Sea disappeared, and new plants and animals emerged. The people who lived during the Palaeo-Indian Period made distinctive long and slender stone lance or javelin points. These elongated stone lance or javelin points were probably used to kill large animals such as caribou. They were carefully chipped to remove thin, parallel flakes from roughly shaped pieces of stone. Their shape and the way they were made indicate that they date from the Late Palaeo-Indian Period (about 8,000 to 8,500 years ago). Two of the examples shown here were found on an island in the St. Lawrence River near Cornwall, rather than in the Ottawa Valley. The point with the small notches may be the only Ottawa Valley artifact from this early time period. During the Archaic Period (8,500 to 2,500 years ago), the Ottawa Valley continued to undergo physical and environmental change. The Ottawa River gradually dropped to its current level, and over a period of five thousand years, forests consisting mainly of white pine became the mixed forests we know today (hemlock, white pine, hardwoods), which appeared around 3,500 years ago. The people who lived in the region during that period made noticeable stylistic changes to their chipped-stone tools. They also used new materials and developed new techniques for working them, in particular stone pecking and grinding, and cold hammering of native copper. The tool shown below was found by James Ballantyne in 1892, 30 feet below the surface of the Graham Brickyard in Ottawa East. James was very involved in local archaeology groups and realized the value of this artifact. He gave it to the Geological Survey of Canada who ultimately turned it over to the Museum of Civilization. The ancient history of the Ottawa Valley ends with the arrival of Europeans, who recorded the way of life of the local Native people. 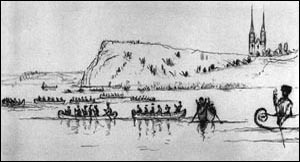 In 1613, when Champlain first travelled on the Ottawa River, he met Algonquin bands and recorded their names: Quenongebin, Oüescariny, Kinouchepirini, Kichesipirini, Otaguottouemin, Matou-oüescariny and Charioquet. However, archaeologists are not sure if those people left behind the artifacts found at late Woodland Period sites. More research is required.